The FAW C Certificate is delivered over five contacts and two off-course mentoring sessions. It is designed to educate candidates in the technical, tactical, physical, psychological and social requirements of modern football. It will develop candidates' ability to plan, prepare, deliver and reflect on coaching sessions for the development of players. Coaches will complete online modules and coursework throughout the course. Coaches will also be expected to deliver practical sessions, both on and off course. However, there is no formal assessment. "I coach Machynlleth Hurricanes U10s and the C Certificate helped me to learn different ways that young players develop over different stages of their lives. 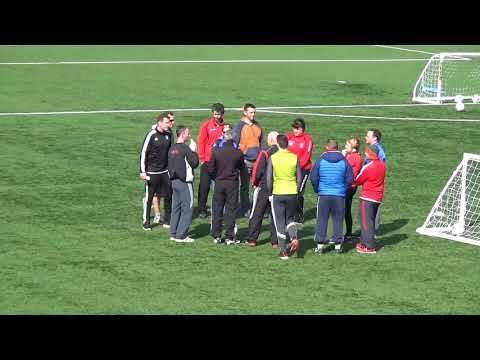 The course gave me a real insight into how to plan sessions to get the most out of my players. I now have lots of drills to help develop them and we can do sessions using the Welsh Way principles, such as breaking lines and switching play."